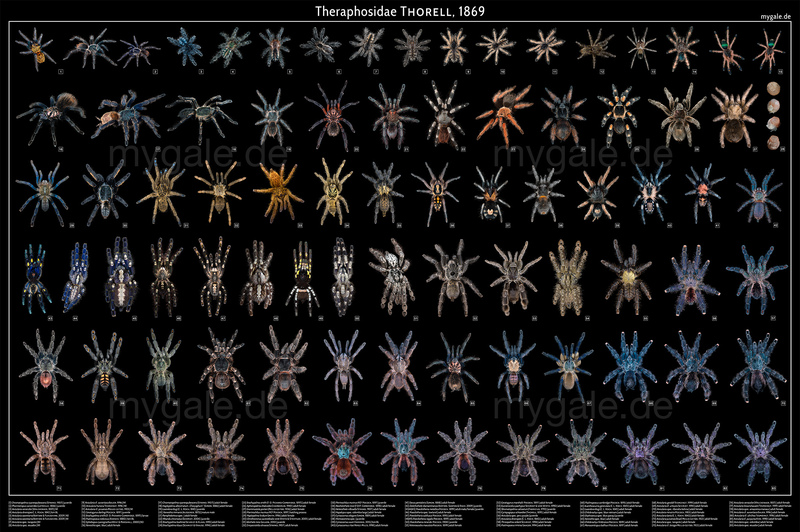 I’m proud to present the latest version of the “Tarantulas of the World“ poster project. This project made it into three significant exhibitions, was printed over 600 times worldwide and was sold to people in over 25 countries! This is the new Tarantulas of the World poster! The new mid-2018 update brings you another five entirely new species on the poster itself, increasing the total number of images up to 107! 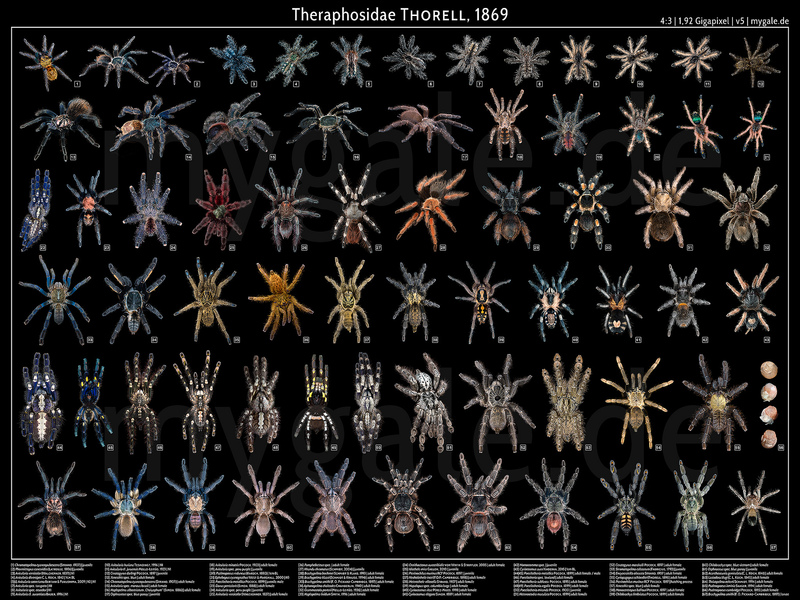 Featuring now over 95 different species of tarantulas in stunning high-quality stacked photography. Furthermore, every image has been edited and edited again down to the smallest pixels of dust. This poster represents the most colorful tarantulas in the best way possible, giving you an excellent overview of the different species in the hobby. It’s the biggest and most detailed tarantula poster ever made, featuring a whole new production concept for the first time. Like on the last Poecilotheria poster, all new images are stacked and have the best quality possible, shot with the best gear available at that point. With over 6000 words and over 55 images, does it feature tons of information about the history of this poster series, its production, and tons of other original photography from me. You can order the poster which includes the book here: arachnogear.com After the purchase, a PDF download will be available in your ArachnoGear member area under „Downloads“. Please note that the handbook is only available as a PDF download and only in English. There is no printed version available yet. 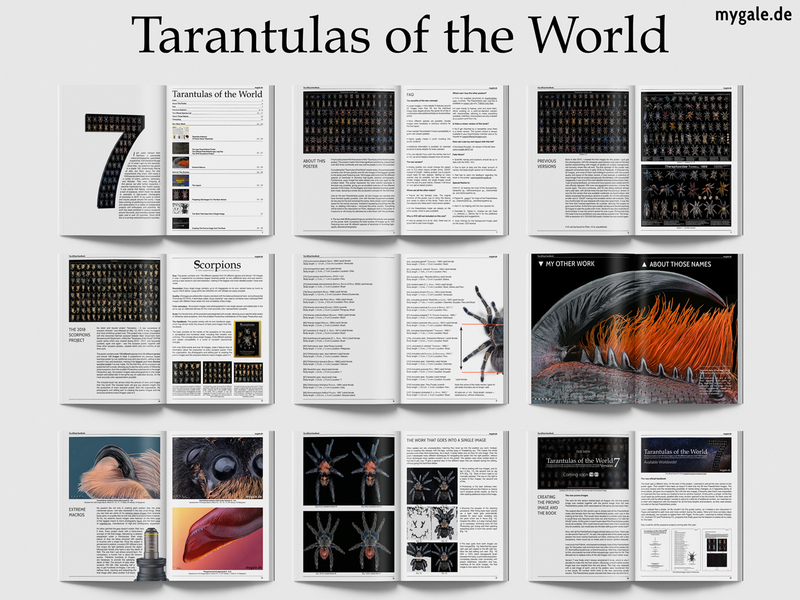 Cumulating the “Tarantulas of the World“ poster series, this revised poster contains over 20 new species and 45 new images in the biggest update to the series ever! Featuring over 100 images and more than 90 different species of tarantulas in stunning high-quality stacked photography. Furthermore, every image has been edited over and over again to the smallest detail. This poster represents the most colorful tarantulas in the best way possible, giving you an excellent overview of the different species in the hobby. It’s the biggest and most detailed tarantula poster ever made, featuring a whole new production concept for the first time. Like on the last Poecilotheria poster, all new images are stacked and have the best quality possible, shot with the best equipment available. As the area for the text remained the same, there simply wasn’t enough space for the names anymore. Instead of squeezing everything into the box, or deleting information, I removed the entire section. Everything will be listed in the description on Flickr, displayed next to the poster in museums or will simply be delivered as a download with the purchase. The new version features 102 images, as the area for the text stayed the same, there simply wasn’t enough space for the names anymore. So instead of squeezing everything onto it, or removing information, I removed the whole section. Instead, they will be listed in the Flickr description, displayed beside the poster at museums or simply delivered as a download with the purchase. 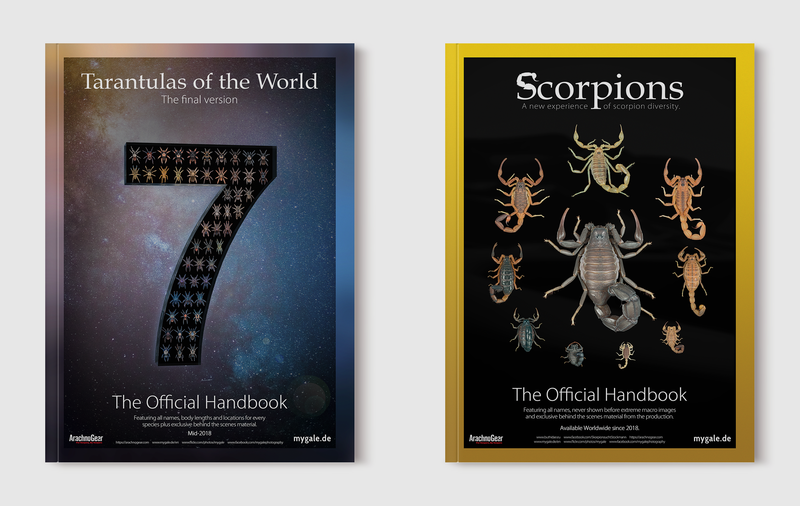 As a list would have been way too simple, I designed a whole handbook coming together with the purchase on arachnogear.com, featuring besides all locations and body lengths for every species additional information about the poster and exclusive behind the scenes material! Making it worth a look and one of the best new features! All the focus stacks are redone with a different software (Helicon), for a much better quality and I fixed some other issues from the previous version and matched the brightness/saturation for all pictures. All other previous versions can be found in the official handbook!